Does Your Vineyard Need a Booster Shot? The pictures on the left are plants inoculated with a rudimentary mycorrhizal inoculum without the benefit of Genesis Soils proprietary components. The pictures on the right are duplicate grapevines having the benefit of Genesis Rhizo-Gen. The pictures show double the top growth and general health compared to the rudimentary approach. St. Helena, Calif.—Rather than crossing their fingers and hoping that the yeasts in their vineyards and cellars will achieve a desirable fermentation, most winemakers inoculate their musts with targeted cultured yeasts. Could inoculating vineyards with selected strains of naturally occurring organisms prove equally useful? “Yes indeed,” according to a supplier of these products. He claims that this technique can reduce water use and disease pressure, two subjects of great import to all grapegrowers. Bruce Coulthard of Genesis-Soils sells a blend of five cultured natural mycorrhizae and complementary ingredients especially selected to aid grapevines. He says inoculating vines with these spores can significantly reduce vine stress, reduce water requirements and fight some plant diseases. Mycorrhizae are fungi that naturally exist in symbiotic relationships with most plants. They colonize the roots, producing tiny tendrils that help the plant extract moisture and minerals from the soil. In turn, they get nutrients from the plant’s photosynthesis. But Coulthard says that vineyards don’t typically contain enough of the mycorrhizae—especially not enough of the optimum strains. He says that proper treatment using his Genesis Soils Rhizo-Gen mycorrhizae can result in 60-85% colonization. “Why are we not inoculating our vineyards at the cost of a fertilizer application?” he asks, estimating the cost at 20 cents per vine. The ideal approach is to inoculate young healthy vines before planting, but the cultures can also be applied through drip irrigation systems. In addition to inoculating vines, Coulthard recommends doing the same with cover crops so the whole vineyard contains strong mycorrhizal colonies. He warns that excessive fertilizer, especially nitrogen and potassium, can damage the fungi. "Mycorrhizal inoculation is showing clearly that using a mycorrhizal inoculum… at the rates they recommend… reduces water use and water stress in winegrapes. “A number of researchers around the world are showing that mycorrhizal fungi are critically important in becoming sustainable. Use of pesticides and inorganic fertilizers suppress the growth of these water and labor saving beneficial fungi. More practical demonstrations of benefit…is very much needed." 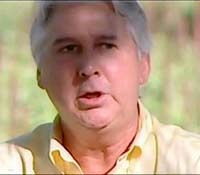 Coulthard has not done any academic studies, but has conducted extensive trials including at 10,000-case Spring Mountain Vineyard, St. Helena, under the direction of vineyard manager Ron Rosenbrand. The tests measured water stress in 4- to 11-year-old Cabernet vineyards using a plant moisture stress indicator (pms), also known as a pressure bomb. The objective was to compare the differences of stress using beneficial fungi compared to non-inoculation. 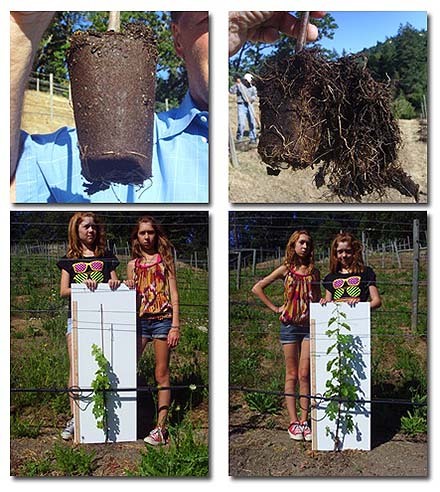 In early July 2008, each vine was inoculated with Rhizo-Gen liquid through the existing drip system by means of an Ag Solution Master in-field mixing unit. Vines were pre-irrigated with 2 gallons of water; inoculation followed with an additional gallon, followed by a post-inoculation irrigation of 2 gallons. During the following 30 days, 2-gallon irrigations were applied two weeks apart, ensuring adequate moisture at the root zone to aid in the colonization of the mycorrhizae. Fertilization was corrected by using California Organics Phytamin 4-3-4 liquid. Recommended dosages were applied each time irrigation was used. Correction was from a generic synthetic high P and N, which inhibit mycorrhizae hyphal colonization to the organic-based fertilizers, which allow colonization to occur. All six vineyard blocks had two control rows next to each other in various locations in the vineyard blocks. All other rows were inoculated. PMS readings were taken by the same employee, at the same vines, at the same time each day. Readings commenced on July 2, 2009 and were completed on Sept. 25. A total of 432, readings included control and inoculated vines. Air temperatures were taken simultaneously. During the data accumulation period, normal irrigation regimes remained in place to keep stress levels in check. At this time of year, typical PMS readings in this hillside vineyard are 10-14 Bars. Once the readings reach 15 or greater, water is applied to reduce the transpiration rate. Where Genesis was applied, readings were consistently 1-2 bars lower than the control rows. This equates to a 25-50% reduction in stress levels, as evidenced by the PMS readings. Water savings were estimated at an early stage to be 20-40%. Rosenbrand says, “My results using Genesis Soils Rhizo-Gen grape inoculum are far greater than I had anticipated. I have been purchasing young grapevines for many years, trying to find a plant that has the characteristics that I know will help the plant give me the best start possible. Coulthard says that while savings in water, reduced stress and general plant health are well-recognized benefits of healthy mycorrhizae colonies, fighting disease is another plus. 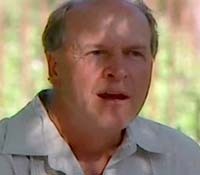 He claims that in addition to improving overall plant health and the consequent ability to fight pathogens, the mycorrhizae provide a hostile environment for leafroll virus, Xylella fastidiosa bacteria that cause Pierce’s disease, and the secondary infections associated with phylloxera, nematodes and vine mealybugs. A cursory look at the academic literature reinforces the importance of mycorrhizae but seem to focus on accidental cultures. It appears a bit skeptical—or perhaps unconvinced—about the efficacy of inoculation. Read an example here. Kate Scow, professor of Soil Science and Soil Microbial Ecologist at the University of California, Davis, tells Wines & Vines, “Mycorrhizae are surely very important. The inoculant efficacy issue is a problematic one. Maybe they help; maybe they are not needed. Enough good research is lacking. I would think one issue is whether the right mycorrhizae have had the chance to establish: Are you inoculating new vineyard land or recently fumigated land, or are you continuing to add to established vineyard (then most likely not needed). Coulthard thinks that some university trials have been affected by the specific strains and application, and welcomes more work. Meanwhile, Spring Mountain’s Rosenbrand and some others seem convinced. If their claims are vindicated, mycorrhizae inoculation could one day be as common as adding specific strains of Saccharomyces cerevisiae to crushed grapes—with comparable benefits.